There's been some pushing and shoving lately to establish a global "Code of Conduct" for outer space — a protection clause for various international factions keen on preventing nefarious actions by others in the final frontier. The U.S. Air Force's secretive X-37B robot space plane landed at Vandenberg Air Force Base in California on Dec. 3, 2010 to end a successful — but mysterious — seven month mission that was shrouded in secrecy. Recovery crews were quick on scene to meet the space drone. From some experts, you get the sense that there's a quest under way for a Robert’s Rules of Order for space, with a shot of Emily Post etiquette mixed in for good measure. Meanwhile, other analysts lean toward an approach much like Martha Stewart's outlook for tidiness — a recipe for spacefaring nations to adopt and avoid collective mayhem in the cosmos. But despite that debate, the big question remains: What exactly constitutes misconduct in space? "Tough to say what misconduct would entail," said Marcia Smith, a veteran space policy analyst in Washington, D.C., and the founder and editor of SpacePolicyOnline.com. Similar in view is Michael Krepon’s, co-founder of the Stimson Center in Washington, D.C., and director of the South Asia and Space Security programs for the organization. "Using space objects for target practice and creating massive, long-lasting debris fields is the height of irresponsible behavior in space," Krepon said. It should be noted that Krepon has long been an outspoken and upfront advocate for hammering out a Code of Conduct for outer space activities. His Stimson Center is a nonprofit, nonpartisan institution devoted to enhancing international peace and security through a unique combination of rigorous analysis and outreach. "Carrying out lesser acts of purposeful, harmful interference also constitutes misconduct, in my view — especially in periods of heightened crisis between major powers," Krepon told SPACE.com. This NASA chart shows the historical growth of man-made space debris around Earth since 1960. A third example, Krepon added, is failure to take actions that could result in long-lasting, indiscriminately hazardous debris fields. That involves leaving enough fuel in a tank to move dying satellites out of heavily trafficked zones, as well as failure to provide a "head's up" regarding possible run-ins between satellites. For some space experts, there is a growing scorecard that checks wrongdoing in outer space. "While the code is not a major step forward — it essentially puts in one place the various norms that already exist — it is to be welcomed as a norm-strengthening instrument and should be adopted by all," said Theresa Hitchens, director of the United Nations Institute for Disarmament Research (UNIDIR), an autonomous institute within the U.N.
UNIDIR conducts research on disarmament and security with the aim of assisting the international community in its disarmament thinking, decisions and efforts. Clearly, undertaking destructive anti-satellite tests in orbit is misconduct, in that the creation of debris fields threatens other satellites — as well as raises tensions among spacefaring nations, Hitchens said. But other forms of misbehavior can be flagged, too. "For one thing, it should be deemed misconduct to jam or laser others’ satellites in peacetime," Hitchens told SPACE.com. Indeed, deliberate interference is prohibited under the International Telecommunications Union (ITU) treaty, she added — although that only applies to radio frequency interference. Hitchens said that it should also be considered misconduct not to warn other operators if your satellite becomes a wandering, out-of-control space asset. An example, she said, is the U.S. failure to publish the whereabouts of the dead U.S. Air Force Defense Support Program (DSP 23) missile warning satellite. "DSP 23 as it drifts through orbit should, in my opinion, be considered misconduct. It is not the U.S. right to determine for other operators when that satellite constitutes a threat to working satellites," Hitchens said. "It should be the threatened operators who get to make decisions about 'how close is a close approach' and when to take collision-avoidance measures." Another example is the commercial communications satellite Galaxy 15 operated by communications provider Intelsat. Galaxy 15 experienced a major malfunction last year that left its communications payload stuck on, but drifting aimlessly in orbit, leading some in the space industry to christen it a "zombie satellite." Intelsat worked closely with other satellite operators to prevent the stuck-on satellite from causing signal interference with other craft. The company ultimately regained control of the Galaxy 15 satellite in late December. But malfunctions aside, can intentional naughtiness in space by some entities ever be construed as acceptable behavior by others? "There has been commendable progress on defining what might evolve into a broadly acceptable Code of Conduct for safe and responsible space operations," said Scott Pace, director of the Space Policy Institute and professor of the practice of international affairs at the George Washington University’s Elliott School of International Affairs in Washington, D.C.
Pace said that work is under way to engage space-benefiting nations and emerging space powers as well as traditional spacefaring nations. But he pointed out that there have been fewer developments in defining what activities would be considered misconduct and appropriate international responses. Wipe out in the heavens. Last month China destroyed one of its own – an aging Fengyun-1C weather satellite – via an anti-satellite test. "What one country may see as misconduct — calling for a particular response — may not be seen in the same way by others, either party to the conflict, allied or neutral," Pace said. He encouraged further international discussion — as expressed within the Outer Space Treaty of 1967 — on what might be recognized as "harmful interference." "Failing to do so risks misunderstanding and misperceptions that could undermine international stability and security … not just in space but on Earth as well," Pace said. Some consider the jamming of satellites as misconduct, Pace noted. A case in point is the recent protest over the government of Iran's intentional jamming of satellite transmissions of the Voice of America’s Persian News Network and Radio Free Europe/Radio Liberty's Radio Farda, Pace said. "But it hasn't been brought up as an outer space treaty violation explicitly," he added. "The aim of a Code of Conduct should be to assure the beneficial uses of outer space and to minimize the hostile and irresponsible ones," said Laura Grego, a scientist for the Global Security Program at the Union of Concerned Scientists in Cambridge, Mass. Because of the nature of space, Grego said, the behavior of each user affects all the others. So at a minimum, a Code of Conduct must support the norm of no deliberate interference with others' satellites, but also clearly establish what pains one must take to avoid inadvertent interference and miscommunication about intentions, she said. "Space is big, but not big enough to accommodate a space user carelessly generating dangerous amounts of space debris by not properly disposing of the detritus of space operations or by deliberately destroying an orbiting satellite," Grego told SPACE.com. A "rules of the road" approach for outer space could a worthy effort, but only if it is championed by genuinely well-meaning advocates, space analysts said. Unfortunately, the vast bulk of these advocates are pushing for a Code of Conduct as a means of keeping the U.S. military out of space activities as a palatable substitute for an "anti-weaponization cause célèbre," said Everett Dolman, professor of military strategy at the School of Advanced Air and Space Studies at Maxwell Air Force Base in Alabama. Among a host of issues that Dolman spotlights is that the code should state that weapons in space should not create or increase debris or in any manner impinge on the peaceful use of space. 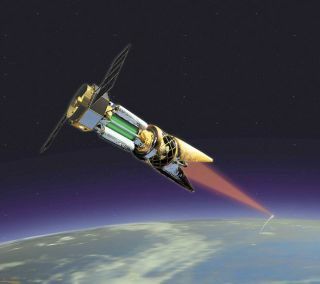 "Indeed, I can imagine a use for lasers or other directed-energy weapons that would clean up debris and make operations there safer than they currently are," Dolman told SPACE.com. What the proponents of current code proposals generally fail to recognize, Dolman said, is the positive contribution of military operations in the global commons during routine or peaceful operations. "The U.S. Navy and Air Force are the two most important critical enablers of both, ensuring adherence to properly enacted rules of conduct in the oceans and international air space … be it policing Somali pirates, clearing lanes of commerce of obstructions and impediments, or tracking criminal trafficking in and through these commons," Dolman said. Dolman said that, if the proponents of a space commons Code of Conduct are successful in essentially ending the ability of the U.S. to ensure access and protect space commerce and support in times of peace — and deny access to an adversary or rogue state in times of conflict — "the likelihood of an effective and enforceable Code of Conduct actually working is slim to none." For Dolman, there's a bottom line to a Code of Conduct for space. That is, if it does not embrace military support of the code, "it is likely to create a more dangerous and inefficient operating environment," Dolman concluded.